I’m not even sure our AOL acquisition has legally closed yet. But today we celebrate our new corporate overlords with…an internal all hands. 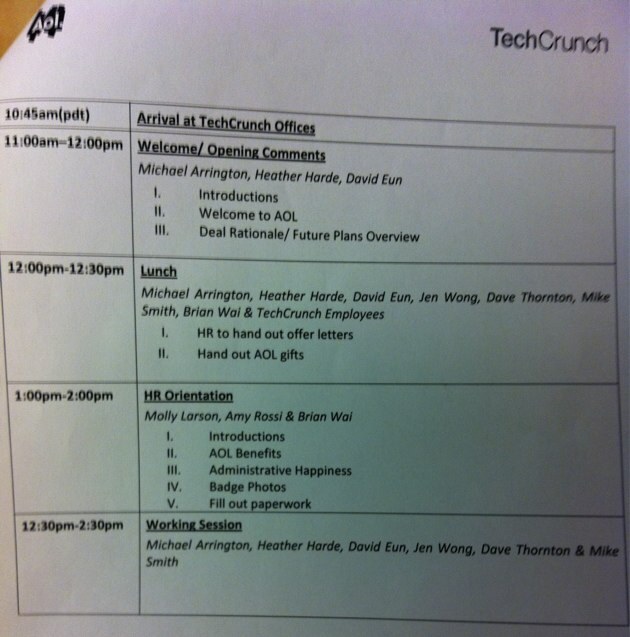 EVP David Eun, Heather’s new boss, scheduled a whopping 3.5 hour all hands meeting today starting at 11. Everyone’s here in the office pretending like it’s perfectly normal to be awake and in the office at this ridiculous hour. 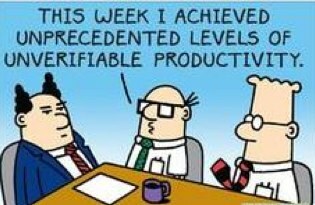 And God help us if news breaks, because we’ll all be in the conference room acting out a Dilbert cartoon. I really don’t like internal meetings, even if they do serve a purpose. We once had an all hands here at TechCrunch but it ended after a few minutes because I wanted to go back to my office and do anything else besides be in a meeting. I really hope this doesn’t become a regular thing. Ok, I’m off to go review HR policies, or something. On the upside, there’s a guy here named Brian from corp dev and I think with enough pressure he’s going to tell me all the other acquisition deals AOL is working on. Update: The agenda! We get gifts!